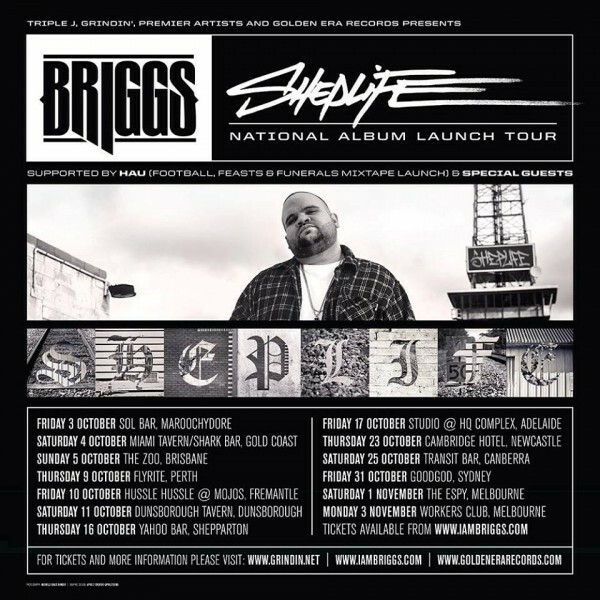 Briggs — Shepparton’s finest rapper, unofficial mayor, and winner of the 2014 National Indigenous Music Award’s National New Talent of the Year award — has a new album out on Golden Era Records, ShepLife. The second single off the album is ‘Bad Apples’; the first, with Gurrumul, is ‘The Hunt’: both tracks get ***** from me. The National Album Launch Tour starts in Maroochydore on Friday, October 3 and ends in Melbourne on Monday, November 3. Get into it! This entry was posted in Music and tagged Bad Apples, Briggs, Golden Era, ShepLife. Bookmark the permalink.